I think the title says it all. I can't see any reason employers have to incentivize employees to contribute to their 401(k) evenly throughout the year. Instead couldn't they use a relatively simple formula that is based on how much of their income the employee has contributed to their 401(k) thus far for the year? If that or their current contribution is over the threshold, they get the match this pay period, even if they didn't contribute anything. EDIT: To clarify, my employer matches 100% of the first 3% of my contribution and 50% of the next 2%. The match is added every pay period along with my contribution. 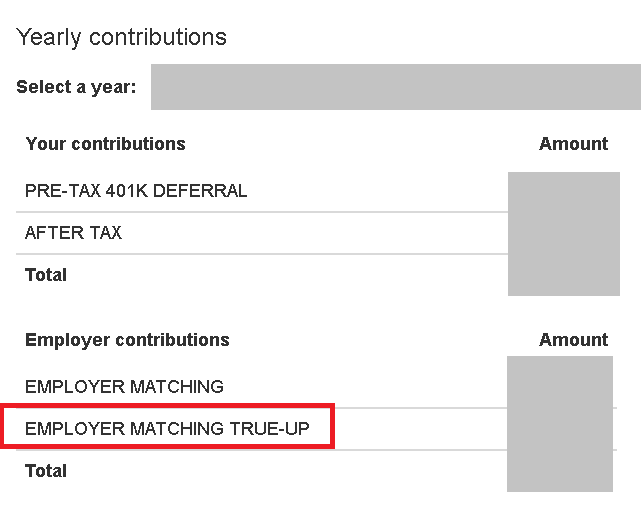 I am pretty sure there is no "true-up" feature, so if I were to hit the $17.5K limit early, and not be able to contribute at least 5% of my salary, I would not get the full match. So I have to be careful to make my contributions evenly throughout the year to get the maximum match. Just trying to figure out my employer's motivation for requiring this. The only way to know the specific explanation in your situation is to ask your employer. Different companies do it differently, and they will have their reasons for that difference. I've asked "But why is it that way?" enough times to feel confident in telling you it's rarely an arbitrary decision. Vesting, in a sense - Much as stock options have vesting requirements where you have to work for a certain amount of time to receive the options, this policy works as a sort of vesting mechanism for your employer matching funds. Without it, you could rapidly accumulate your full annual match amount in a few pay periods at the beginning of the year, and then immediately leave for employment elsewhere. You gain 100% of the annual match for only 1-2 months of work, while the employees who remain there all year work 12 months to gain the same 100%. Dollar Cost Averaging - By purchasing the same investment vehicle at different prices over time, you can reduce the impact of volatility on your earnings. For the same reason that 401k plans usually restrict you to a limited selection of mutual funds - namely, the implicit assumption is that you probably have little to no clue about investing - they also do other strategic things to encourage employees to invest (at least somewhat) wisely. By spacing their matching fund out over time, they encourage you to space your contributions over time, and they thereby indirectly force you to practice a sensible strategy of dollar cost averaging. Dollar Cost Averaging, seen from another angle - Mutual funds are the 18-wheeler trucks of the investment super-highway. They carry a lot of cargo, but they are difficult to start, stop, or steer quickly. For the same reasons that DCA is smart for you, it's also smart for a fund. The money is easier to manage and invest according to the goals of the fund if the investments trickle in over time and there are no sudden radical changes. Imagine if every employer that does matching allowed the full maximum match to be earned on the first paycheck of the year - the mutual funds in 401ks would get big balloons of money in January followed by a drastically lower investment for the rest of the year. And that would create volatility. The Bottom Line - Your employer (let us hope) makes profits. And they pay expenses. And companies, for a variety of financial reasons, prefer to spread their profits and expenses as evenly over the year as they can. There are a lot of ways they achieve this - for example, a seasonal business might offer an annual payment plan to spread their seasonal revenue over the year. Likewise, the matching funds they are paying to you the employees are coming out of their bottom line. And the company would rather not have the majority of those funds being disbursed in a single quarter. They want a nice, even distribution. So once again it behooves them to create a 401k system that supports that objective. To Sum Up Ultimately, those 401k matching funds are a carrot. And that carrot manipulates you the employee into behaving in a way that is good for your employer, good for your investment management company, and good for your own investment success. Unless you are one of the rare birds who can outperform a dollar-cost-averaged investment in a low-cost index fund, there's very little to chafe at about this arrangement. If you are that rare bird, then your investment earning power likely outstrips the value of your annual matching monies significantly, in which case it isn't even worth thinking about. If one makes say, $10K/mo, and the company will match the first 5% dollar for dollar, a 10%/mo deposit of $1K/mo will see a $500/mo match. If the employee manages to request 90% get put into the 401(k), after 2 months, he's done. If the company wished, they could continue the $500/mo match, I agree. They typically don't and in fact, the 'true up' you mention isn't even required, one is fortunate to get it. Many companies that match are going the other way, matching only after the year is over. Why? Why does any company do anything? To save money. I used to make an attempt to divide my deposit over the year to max out the 401(k) in December and get the match real time, not a true up. There's no such requirement in general. If your particular employer requires that - you should address the question to the HR/payroll department. From my experience, matches are generally not conditioned on when you contribute, only how much. Since 2017, the majority of employers does not require employees to spread their 401(k) contributions throughout the year to get the maximum match. However, the number of plan sponsors offering true-up matches may increase in the upcoming years ahead, as a recent defined contribution benchmarking survey from Deloitte found 54% of plan sponsors offered a true-up match in their plan design (mirror)—nearly a 10% jump from 45% in 2015. I am pretty sure there is no "true-up" feature. Not the answer you're looking for? Browse other questions tagged united-states 401k contribution employer-match or ask your own question. Why should one only contribute up to the employer's match in a 401(k)?